England is the only country where a major distinction is made between cooking and dessert apples, but these days only one variety remains to maintain the tradition of English cooking apples - the famous Bramley apple. However before the supermarket era the choice was wider, with a whole range of culinary or cooking apple varieties grown, each with their own characteristics and season. Chief amongst the early cooking apples is Grenadier, which ripens by mid-August in the UK. Not much is known of the origins of Grenadier, but it was discovered during the mid-19th century in England and was quite widely grown by the end of the century, although it is no longer grown commercially. Two reasons probably account for Grenadier's fall from favour. Firstly, like all early apple varieties it does not store particularly well, a serious drawback for modern distribution methods. 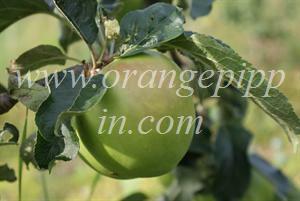 Secondly, it is not the most attractive of apples - it is a lumpen green, often with a pronounced ribbed effect. However, this ugliness is transformed in the pot, where it easily cooks down to cream-coloured puree with a superb apple flavour. Grenadier is also a good base for apple jam. 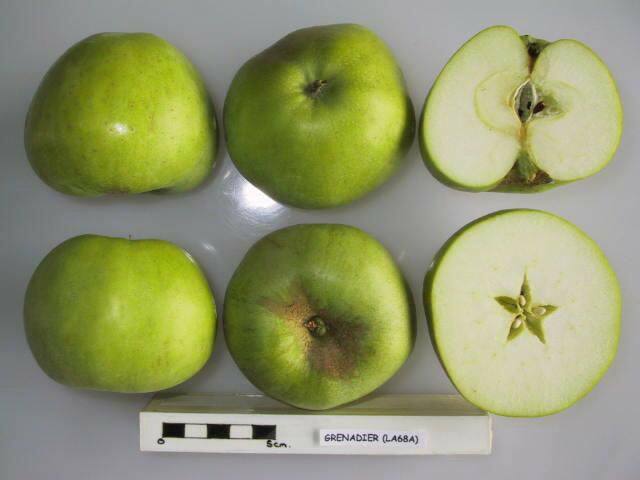 Grenadier is also quite an easy apple tree to grow in the garden, being reliable, resistant to the common apple diseases, and not likely to grow as vigorously as a Bramley. Growing your own is also the easiest way to get over its poor keeping qualities, as you can pick it over a number of weeks. So if you want to make a light English-style apple pie for a summer picnic then Grenadier is exactly what you need. Pretty sure we have one. We peel and core and section after picking and then freeze so can use throughout the year in crumble, Apple plat and devised red cabbage. As others have said early picker and fabulous taste. Moved into my new house in February and have just found out (from the huge ripening apples and help from Brogdales identification service) that I have a Grenadier . What a lovely cooking apple. Puree, crumble and pie so far. Good flavour cooked and raw . Very different to a Bramley which I also love. There is a Grenadier in our garden since the 1880s (four generations of apple tarts, stewed apples.... and 'free' apples for neighbouring children); 9 ft high - produces more than we can use, is 'pruned' by clippers or loppers every second year (more or less)..any tips for the next 130 years ? Restricted non vigorous growth when well cropped. Splendid apple for small gardens. I find it very reliable and keen to fruit. We have had a Grenadier apple tree for over 20 years now and it has always been a good cropper. The glory is we get (sometimes) apples at the end of July and we can pick them until early September. Its only a small tree but we get plenty of apples for our needs and some left over for friends and neighbours.This means we then benefit by neighbours receprocating in September and October with Bramleys etc. So we have 'fresh' apples deep into November and December. We have an old Grenadier at the end of our garden that produces fruit every year, with every other year being a real bumper crop that we struggle to keep up with! As it doesn't keep too long we get peeling, freeze it up, and enjoy fantastic crumbles and purees all through the winter. Have a tree (70 years old) which we have been trying to identify - this sounds like it. In our opinion beats the Bramley hands down! Does anyone have a picture so we could compare and does anyone know of a nursery still selling this variety? We have two of these in our garden in South Liverpool and they will generally fruit every year. Like Vivien in Bristol 2008 has been a great crop. Superb apple for all sorts of uses! We love our Grenadier apples - our small tree does not produce fruit every year but when it does, the flavour and cooking properties are second to none. This year (2008) has seen a wonderful crop. Grows reasonably well here in Eastern Scotland. Almost an eater when really ripe. , but makes great pies also.